The puja gets started with the purification of the space and sankalpam that is the motive or reason for performing the puja. The puja is begun with the prayers of Lord Ganesha so as to remove every obstacle that comes on the path of life. This is done by chanting the mantras of Ganpati, showering flowers to the deity, and offering the Prasad that consists of different fruits and sweets. Along with this puja, the Varun puja that is worshipping the Kalash is also performed side by side. One of the distinct steps or rituals performed during the entire puja vidhi is invoking the pancha lokapalaka, navagrahas, and the eight dikpalakas. In this step, every God has its own power and worshipping them has some significance. Each of them is a vedic figure. These vedic symbols are represented by coins in this puja. The coins are placed on separate betel leaves. And betel nuts, dry dates, and akshit are the offered to them separately. This counts to forty betel nuts, dates, and akshit for offering all the forty coins. The actual puja commences with the prayers for Lord Satyanarayan. The deity is bathed with panchamritam. And after that the holy mantras are chanted by the pandit and the other devotees to get showered with the blessings of the Lord. This step is followed by offering the flowers and the Prasad. One of the steps that needs a special mention is that the pandit must read out the story of Satyanarayan and the devotees must sit and listen to the same with utmost concentration. The story tells about the origin of this puja, the significance of worshipping Lord Satyanarayan, the importance of the Prasad, etc. The vidhi ends with the aarti, lighting the camphor, and distributing the Prasad. 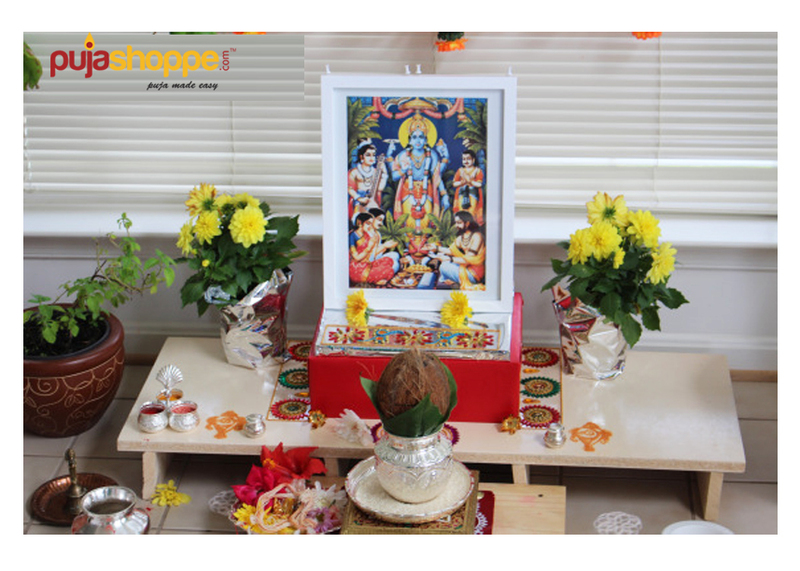 Now, there are some special occasions on which this puja is performed like griha pravesh. But, what if you are not the one who has owned the new house but the one who is invited to attend the puja? Will you attend the puja and visit the new home of your loved one empty handed? It won’t look good. Isn’t it? A good idea can be buying something spiritual. You can explore the ideal divine gifts online now at Pujashoppe and choose something that can bring serenity and good fortunes in their life.